It’s one of the truisms of sport – athletes learn more from losing than winning. While the matches played out differently, the common thread for Shapovalov and Auger-Aliassime was nerves. Shapovalov made eight unforced errors in his 18-point opening game and, even though he held serve, Federer broke him in his next two service games and coasted to a first set win. In the second, Shapovalov had his best opportunity. Leading 1-0 he had his only break points of the match at 15-40 on the Federer serve but the savvy Swiss served-and-volleyed away the first one and then on the second Shapovalov hit long, failing to keep a second serve return in play. Auger-Aliassime manoeuvred himself into winning positions in both sets against Isner – serving for the opener at 5-4 but hitting three double faults in the final four points. Then, serving for the second at 5-3, he hit a double fault and missed a forehand swing volley into the net on two of the last three points. That allowed Isner back into the set. The Isner serve was key in both tiebreaks – in the second he won four points directly off it while Auger-Aliassime got zero easy points on his serve. As brilliant as Auger-Aliassime has been in beating seven players (two in qualifying) to reach the semi-final, he was never quite the commanding presence he had been in his other matches after those three double faults in the tenth game of the first set. Not too long after the match, Mark Petchey – a former British player, coach of Andy Murray and currently a commentator – tweeted about seeing the Canadian out on the practice courts. The serve has been a concern at times recently for Auger-Aliassime – with commentator Brad Gilbert harping about the inconsistency of his toss during ESPN’s coverage of the Isner match. Double faults have been too frequent but, up until Friday’s semi-final, he had overcome them with timely, all-round solid serving. Over his eight Miami Open matches – including qualifying, Auger-Aliassime had 38 double faults, which averages out to 4.7 per match. If you take Federer, and the exemplary Swiss may be an unfair comparison, he has had a total of just eight double faults in his last six matches – including the Indian Wells three-set final against Dominic Thiem. He never had more than two in a match and his average is 1.3. The shortcomings against Isner should not overshadow the fact that Auger-Aliassime served brilliantly and to devastating effect in winning other matches – perfect examples being against No. 36 Marton Fucsovics in the second round and No. 19 Nikoloz Basilashvili in the round-of-16. Shapovalov (above watching Federer’s agent Tony Godsick and friends go by) showed lots of guts and fabulous shot-making in his four victories – especially during brutal rallies against contemporaries in the round-of-16 and the quarter-finals, No. 10-ranked Stefanos Tsitsipas, 20, and No. 34 Frances Tiafoe, 21. Isner, after hitting a 140 mph serve to wrap up the hour and 53-minute match against Auger-Aliassime, appeared to say “good job” to him as they shook hands at the net and then applauded as the 18-year-old Montrealer walked off. 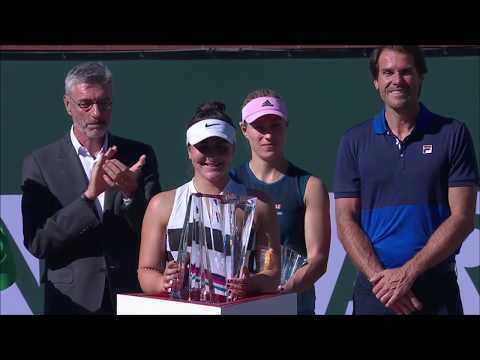 Just as Bianca Andreescu, 18, made the tennis world aware of Canadian prodigies two weeks ago with her triumph in Indian Wells, Shapovalov and Auger-Aliassime have left an indelible mark with their performances at the Miami Open. Shapovalov’s ranking will move to No. 20, making him only the second Canadian in the 45-year history of the ATP’s computer rankings – after Milos Raonic in 2012 – to enter the top-20. Aliassime started 2019 at No. 109 and has vaulted to No. 33. He has only 52 of his current 1,245 points to defend between now and June – so some strong performances during the upcoming European red clay-court season should move him even higher. Both he and Shapovalov will next play the Masters 1000 event in Monte Carlo starting on Sunday April 14th. A year ago Shapovalov lost his opening match in Monte Carlo to Tsitsipas while Auger-Aliassime was beaten in the first round by Mischa Zverev. So there’s an immediate opportunity for both to improve their rankings. While there’s ongoing speculation about which of the two will eventually turn out to be the better player, what many don’t dispute is the potential of Shapovalov and Auger-Aliassime to reach the top five in the rankings and to win Grand Slam titles. It’s exactly the same thing that’s being said about Andreescu. The past four weeks in Indian Wells and Miami have been transformative for Canadian tennis. It’s not exaggerating to believe that someday they will be viewed as the moment when the nation introduced players who transformed the sport on the world stage. One of the most memorable moments for Félix Auger-Aliassime during the Miami Open was meeting former Toronto Raptor and Miami Heat basket-baller Chris Bosh. Here are the 6-foot-4 Auger-Aliassime, the 6-foot-11 Bosh and the 6-foot-2 Borna Coric.